Listed under Temples in Lanzhou, China. 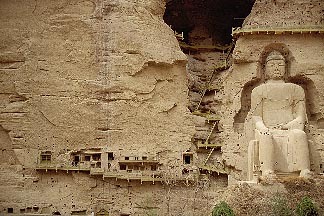 Built precariously into a sheer cliff face, the Bingling Grottoes/ Caves or Temples are a complex of caves into which Buddhist statues and murals have been carved over hundreds of years. Carving began in 420 AD and was added to until the 17th Century. Bingling is a translation of the Tibetan, Ten Thousand Buddhas, currently there are just under 700 clay sculptures and around 900 square metres of carved murals in 183 caves. Narrow walkways allow access to the site (though the original artists possibly worked lowered over the 60m high cliff above a gorge of the Yellow River. ), but it’s the lowest grottoes which are the most impressive. Each statue is unique, the largest over 27 metres high and the smallest under 25cms. You can only reach the caves by boat when the water level is high enough in summer.